This affordable housing at 847 Saint Nicholas Avenue lottery checks all the boxes. 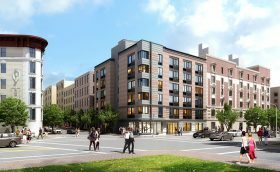 Most importantly, the units are actually affordable, available to low-income households earning 40, 50, or 60 percent of the area median income and ranging from $475/month studios to $1,166/month two-bedrooms. It’s in the beautiful Hamilton Heights/Sugar Hill Northwest Historic District, is the new home to the Dance Theater of Harlem, and offers tenants a laundry room, fitness center, first-floor rear year, and seventh-floor terrace. Homes along the coveted tree-lined Convent Avenue in Hamilton Heights rarely become available, but here’s a chance to own a piece of NYC history. The five-bedroom brownstone at 325 Convent Avenue just hit the market with an asking price of $3,850,000. The last time this property sold was back in 2001 when it was snagged for a mere $585,000! 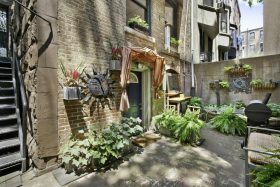 This 4,500-square-foot brownstone is a fantastic investment filled with original details, a beautiful garden, and a manicured front lawn. Our ongoing series “My sqft” checks out the homes of New Yorkers across all the boroughs. Our latest interior adventure brings us to Laurence and Antoine’s 19th-century Hamilton Heights townhouse. Want to see your home featured here? Get in touch! France natives Laurence and Antoine moved to NYC in 2006, after spending 12 years in Frankfurt, Germany. Antoine’s career as a software developer brought the family of six across the pond, where they landed in Turtle Bay. But once they got acclimated, they knew they wanted a neighborhood with more character. So eight years ago, they bought a historic brownstone in Hamilton Heights. When asked if they miss anything about living in Midtown they quickly say “no,” as they’ve fallen in love with Hamilton Heights’ charm, convenience, and friendly neighborhood feel. But take away what’s outside, and Laurence and Antoine’s home alone would be enough to make any New Yorker fall in love. 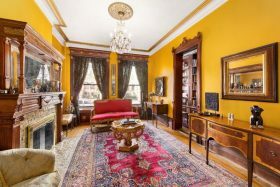 Built in 1890, the 21-foot-wide brownstone retains almost all of its original details, such as elaborately carved moldings and fireplaces (five, to be exact), cozy window seats, and jaw-dropping foliated screens in the master bedroom. However, with their children now out of the house, the couple is ready to downsize and has put their home on the market. But before they depart, Laurence and Antoine invited us in for a personal tour. 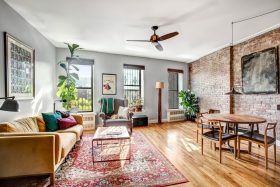 The secret’s been out about Hamilton Heights for quite some time now, but there are still some great real estate deals to be had. 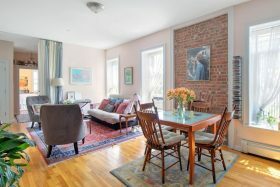 For example, this completely charming condo at 789 Saint Nicholas Avenue takes up the full floor of a townhouse, has two bedrooms, and offers a winning combo of vintage details and renovated amenities–all for $790,000. And with a location just four blocks from the A, C, B, and D trains at 145th Street, you can get to Midtown in no time. Will 2018 be the year quirky and historic Hamilton Heights ‘Art House’ sells for $2.7M? 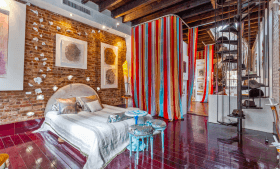 This unusual three-family townhouse at 532 West 148th Street in Hamilton Heights was purchased by Portuguese-born architect Luis Da Cruz in 2006 for $995,000 and thoroughly renovated as a canvas for the artist’s personal creative vision. Cruz restored the 1920 home’s carved wood stairways and railings, moldings, five fireplaces, beamed ceiling, and exposed brick walls, and added his signature art pieces to an eclectic, bohemian decor, calling the house Musée Maison (Museum House) and making it his studio and workshop. He also hosted art events during which all of the work was for sale and he would perform tricks on aerial silks suspended from the ceiling. The house itself has been on and off the market since 2007. In 2015 6sqft featured the artsy listing at $2.5 million and again after a broker change in 2017 asking $2.7M. Now, another broker switch and more conventional photos–but no change in price–herald the latest attempt to find a suitably visionary buyer. The interiors at this Upper Manhattan condo at 370 Convent Avenue are as tranquil as they are feminine, and as spacious as they are cozy. The corner apartment is on the 4th floor of a five-story pre-war condo with only two apartments per floor. It’s asking $969,000, and while it doesn’t currently have a craft room, it’s roomy enough to find space for one, and it would certainly fit the surroundings. A corner home located in the spine of the Hamilton Heights Historic District has hit the market for the first time in nearly two decades. Located at 381 Convent Avenue, on the same block where Alexander Hamilton once lived, a four-story townhouse is asking $2.675 million. 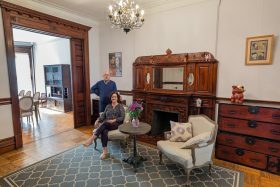 Built in 1893 by John M. Cahill, the Romanesque Revival property measures 3,200 square feet, contains five bedrooms, four bathrooms and an adorable, private garden. Just a few houses down at 327 Convent Avenue, another historic townhouse is for sale for a $3.7 million. 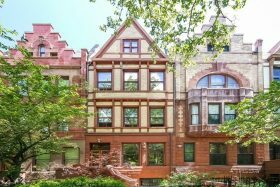 Here’s a rare opportunity to own one of the gorgeous neo-Tudor townhouses on Convent Avenue in Hamilton Heights. Built in 1890 and offered for the first time in 50 years, 327 Convent Avenue is asking $3.7 million. Located a gorgeous block steeped in history (Alexander Hamilton’s country estate was originally just one block away), this six-bedroom home is nearly 5,000 square feet with tons of original details and a sun-drenched backyard. 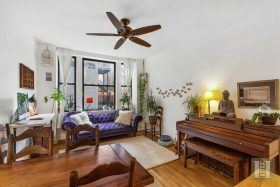 This two-bedroom pad comes from the prewar condo at 706 Riverside Drive, in Hamilton Heights. Though the building is classic the apartment’s been renovated to look more like a zen loft downtown. A “double loft wonderland” was added to the second bedroom, alongside reclaimed wood shelving and unique decor. After last selling in 2007 for $349,830, it is now asking $775,000. In 2015, 6sqft took a look at this unusual Hamilton Heights three-family townhouse at 532 West 148th Street, then on the market for $2.5 million. The home was purchased by Portuguese-born architect/artist Luis Da Cruz in 2006 for $995,000 and thoroughly renovated, emerging as a canvas for the artist’s personal creative vision. Cruz restored the 1920 home’s carved wood stairways and railings, moldings, five fireplaces, beamed ceiling and exposed brick walls, and added his signature art pieces to an eclectic industrial/bohemian decor. Luis called the home Musée Maison (aptly, Museum House), and made it his studio and workshop; he also hosted art events during which all of the work was for sale and he would perform tricks on aerial silks suspended from the ceiling. The home has apparently yet to find the perfect match, and has seen its asking price rise with the market rather than fall to entice buyers; the four-bedroom house was just re-listed for $2.7 million.